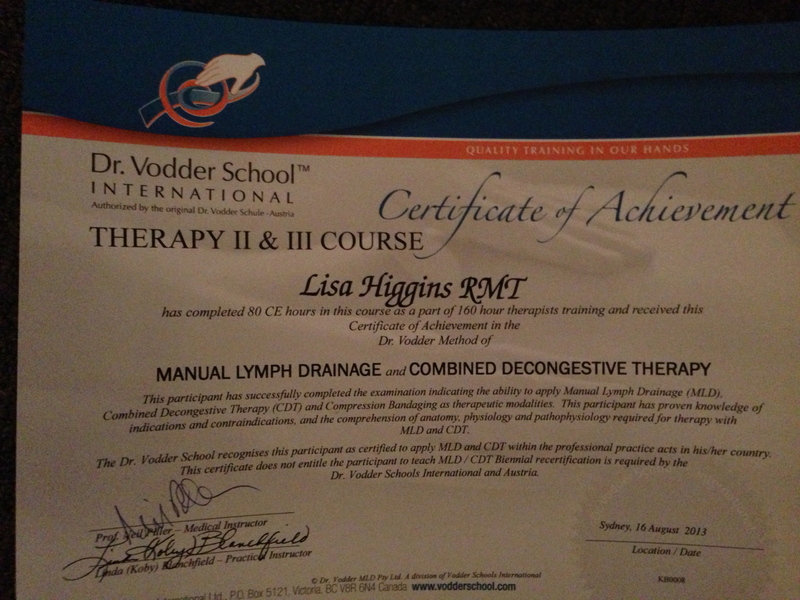 Well, here it is, my certificate showing my certification as a Vodder therapist. It has been an amazing four weeks. I have learnt an incredible amount, met some amazing fellow students and without a doubt some amazing lecturers, whom I’ve named and given links to in previous blog posts. I need to mention at this point the wonderful Sheryl who was in the background helping with organisation and giving us encouragement the whole way through – Sheryl has been a Vodder therapist for many years and her insight throughout the course was invaluable (and I have to mention also her calm and lovely touch, a beautiful addition to the team). Thank you Sheryl. The last few days were pretty intense, with each of us having to perform some of the techniques on Koby, our lecturer (poor Koby, 16 people with nervous, clammy hands all trying to keep calm and do our best), a bandaging exam and a pathology exam. We could have pulled anything out of the hat … for the bandaging it could have been a simple case of lymphoedema post surgery or it could have been a venous issue (or various other things of course), short stretch or long stretch. My case scenario was someone with swelling in the lower leg because of a venous issue, so that called for a long stretch bandage to the knee. For the pathology exam, well, the range of health issues we could have had to deal with was enormous – mastectomies with swelling or fibrosis and arm lymphoedema, or tight scars causing range of motion issues; secondary lymphoedema in the legs post hysterectomy, prostrate cancer, gynaecological cancers; primary lymphoedema in the legs; chronic sinusitis, detached retinas or traumatic eye injuries; tinnitus; Meniere’s Syndrome; facial nerve paralysis; whiplash; migraines; hip or knee replacements; shoulder pathologies; trauma to any joint; venous ulcers; treatment after cast removal after fractures … you name it. Out of all that, I pulled out a mastectomy with nodes removed from the axilla and radiation with swelling in the arm. 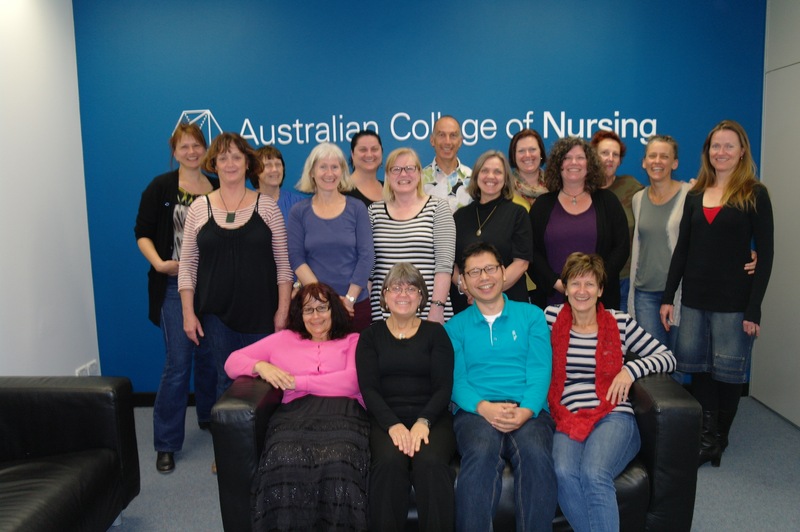 We finished our exams by about 12.30 on Friday and we were given a long lunch until 3pm while Koby collated all our marks. We trooped along to the food court and all had lunch together then made a dash to the park in Burwood to soak up some of the beautiful sunshine we’d been missing, it was the most perfect day to be outdoors. Then it was back for photos and results. This weekend I’ve been playing catch up with all the things I’ve neglected for the last four weeks … the kids, the cleaning, speaking to family and friends, walking around the farmer’s markets and enjoying a coffee outdoors. It feels strange to be able to sit down and not have to study or practice something, but I’m certainly not complaining! Really looking forward to putting it all into practice now. Thanks to everyone for their support throughout, your words of encouragement have really spurred me on. I am so happy for you…..